Aurel Scheibler is pleased to present new works by Alessandro Twombly (*1959) in his solo exhibition Five Sculptures. Working both with sculpture and painting, the artist continually explores the relationship between art and nature. In his newest works, Twombly remains true to his artistic concerns as well as his visual vocabulary and discovers the way to express universal ideas by means of abstract imagery. The titles of Twombly’s works indicate the artist’s interest in fundamental, cosmological phenomena and the process, in which they can become concrete. For example, in Rising we discern an upward motion, Cumulus conveys an impression of accumulation and lightness, while Terra transmits the idea of a common origin. Even though these works do incorporate rather extensive, metaphysical terms, they still disclose striking hybrid identities. Twombly’s sculptures frequently take on the guise of organic formations, such as solidified sea plants, corrals, or frozen lava flows. However, they are not representational, but rather appeal to the essential and invisible inner powers of nature. Their dynamic shapes visualize the idea of metamorphosis, the perpetual transformation that underlies growth, progress, and existence. Twombly’s sculptures oscillate between the familiar and the undefinable, a tension they share with natural phenomena. The surface of the sculptures reveals the process of molding. 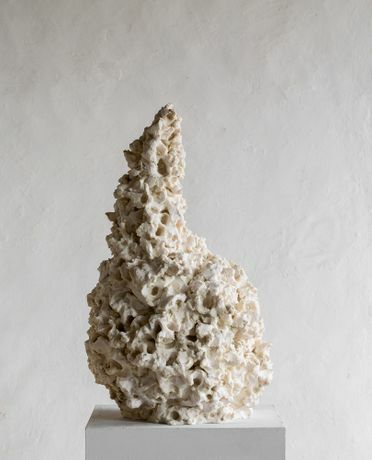 Twombly uses traditional working techniques to form the shapes out of clay, terracotta or plaster prior to casting them in bronze or resin. The movements of his fingers are visible on the surface, and hence the creative practice is embedded into the artwork. Following the terminology of Roland Barthes, who stated the death of the author as the independence of a work from its creator, Twombly’s sculptures speak to the trace of the author – the sign of artist’s presence fused within the material itself.